Premiere of two new compositions, Lightbobs, by John Traill, at Symphony Hall, Birmingham, Saturday 15th March 2014, 7.00pm. Commissioned by the Oxfordshire County Music Service, Lightbobs is comprised of two versions, for 200 beginner instrumentalists, and 200 children’s voices. Both versions are accompanied by large symphony orchestra (alternative piano accompaniments available). The project has been supported by Arts Council England sponsorship, the charity FYMA (Friends of the Young Musicians Association), with management support funded through the National Plan for Music Education. 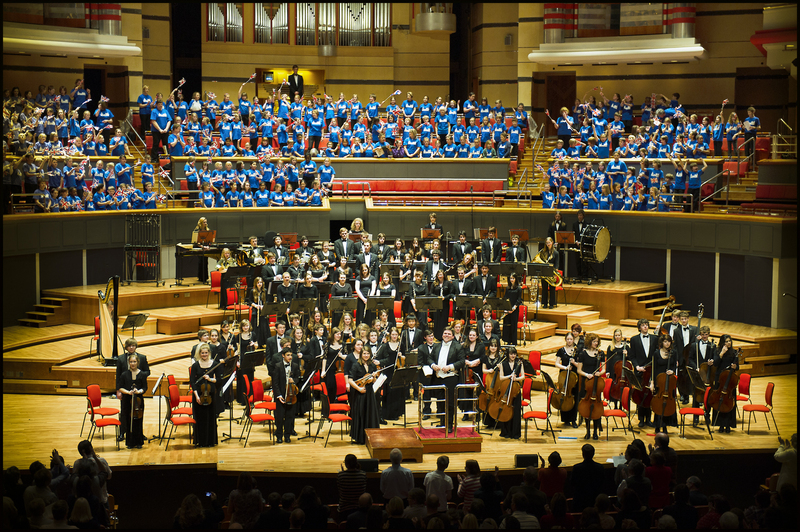 The performances, conducted by the composer, will feature children from schools and choirs across Oxfordshire, accompanied by the Oxfordshire County Youth Orchestra (also featuring a select number of students from St. Anne’s College, University of Oxford, where John Traill is Director of Music). Lightbobs tells the story of the Light Infantry in World War I, with a particular focus on the 1st and 2nd Battalions of the ‘Ox and Bucks’ regiments (the ‘Lightbobs’). It is comprised of five songs, presented in the form of an orchestral poem, and the composition considers battalion bugle calls, regimental marches, and rhapsodic variations on the National Anthem. The symphonic spectacle will be a unique and formative experience for many young musicians from across Oxfordshire. John Traill’s work on Lightbobs has included numerous school visits, joint rehearsals, and research with Kneller Hall, the Rifles, and Soldiers of Oxfordshire museum. (picture from a performance of ‘Oxonia’ at Symphony Hall in 2012, a comparable commission by John - premiered Nov 2011 at the Royal Albert Hall, National Festival for Youth Music Proms).